Prototype: 1 Franconian Switzerland Steam Railroad class V 60 diesel locomotive, 1 type Pwi baggage car, 1 corridor car, 1st/2nd class, 1 type WRi dining car. The train looks as it currently does in real life. Model: The V 60 locomotive is constructed of metal. All driving axles powered. The side rods and wheel sets are black nickel-plated. The 2 passenger cars and 1 baggage car have solid black nickel-plated wheel sets. Train length about 240 mm / 9-7/16". The set includes a large oval of track with 6 sections of straight track 110 mm / 4-3/8" (of them 5 x 8500, 1 x 8590 feeder track), 4 no. 8520 curved track, and 6 no. 8521 curved track. Also included is: a track plan brochure, a rerailer, a locomotive controller, and a switched mode power pack for supplying current. 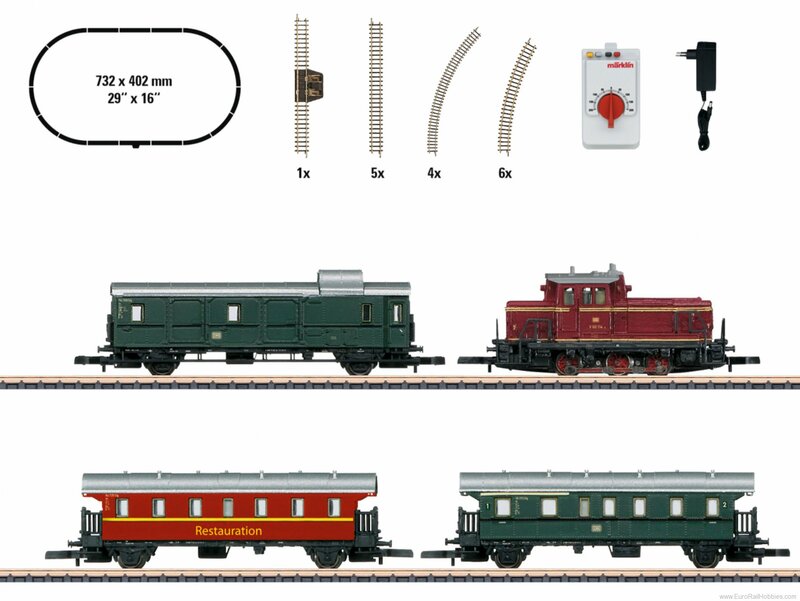 The track plan in this starter set can be expanded with the 8190 or 8191, 8192, 8193, and 8194 SET extension sets or with your own designs. V 60 includes a motor with a bell-shaped armature.